doubleTwist Player for Android: Close, but still left wanting. One of the first questions that I ask of anything I review is if it’s better than current offerings. 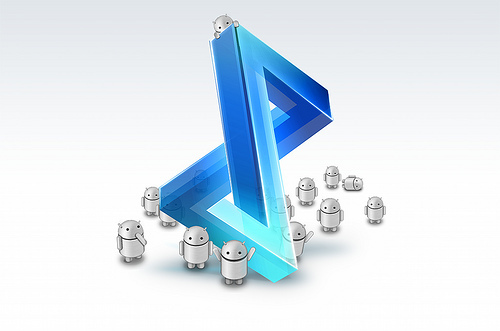 In the case of the (very sharp) new doubleTwist Player for Android, it just doesn’t stack up. The dT Player, as I mentioned, looks great. It’s done very well. However, after using it for a few minutes, I’ve already run into some rather annoying issues. First off, I have a problem with any application that, when loaded onto my phone, needs to be plugged into my computer before it will run correctly. The initial loading screen from the dT Player reminds me of just that. It’s a suggestion box that tells me that I’ll need the doubleTwist software, and offers to send me a link via email. Fortunately, it isn’t required that I sync before using the dT Player, so I dismiss this box. Don’t get me wrong, I’ve raved about the doubleTwist softare, and I still think it’s far and away the best choice for Android users. It’s an amazing piece of software, by itself, but not necessary if I just want a media player on my device. So, passing the nag screen, we get into the player itself, and here’s where my issues with the application really start to show up. First off, it’s very pretty, but adds little functionality that the stock player didn’t already have. On load, dT Player will scan your SD card for any media that’s on there. 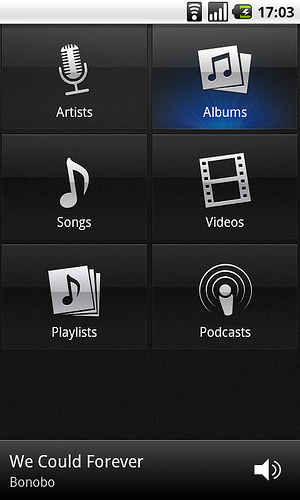 Sadly, that means that it can also pick up any mp3 format ringtones that you might have. I didn’t have this issue, but apparently a number of other people (according to the reviews) have. The other issue (which was probably more intentional, in order to avoid ringtones) is that anything that’s on the device’s memory will not be seen. The menu interface is pretty, but no more clean than the stock player, to be honest. When going into the Videos section, the thumbnails are effective, but very slow to load. Is this an issue with my Droid, or with the software itself? It’s a question that I’ve, as of yet, been unable to answer. Any files that do not have ID3 tags and are loaded into a folder will inherit that folder name as their album. Not really a problem, but it’s an interesting choice for how to do things instead of just labeling them as uncategorized or Unknown Album. Album art for music loads very quickly, and gives great thumbnails. 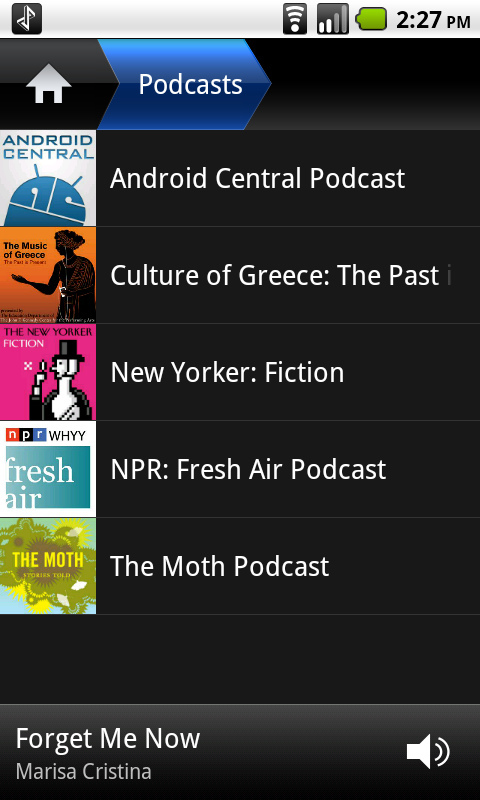 Switching to podcasts, I reach another issue. I have 3 episodes of one of my favorite videocasts, GeekBrief.tv, loaded onto my Droid. I loaded them via the doubleTwist software, so everything should be kosher. However, dT Player has decided to assign them thumbnails from various mp3’s that I have loaded as well. So instead of seeing Cali Lewis‘ smiling face, I see album art for the stock Windows 7 mp3 wma files that came with my Windows installation. Podcast playback, with video, is stunning which is just what I expected it to be since the Droid is an amazing way to watch videocasts anyway. Had it been anything less than stunning, I’d be sorely disappointed. You’re not given the choice to edit any files directly within the dT Player app itself. So if you have a file on your device that you don’t want, you’re stuck with it unless you use another application to delete it. As far as features, that’s the end of things. Therein lies my other present issue with the dT Player. It really should simply offer more. Just being prettier isn’t enough to snag my attention and take up space in my device memory. I’ve contacted DVD Jon, the guy behind doubleTwist, and we’ll see if we can get some comments from him about the current issues with dT Player. In the mean time, it’s probably worth a download, if only to have easy access to know when it gets updated. Read next: Rummble: Truly smart location suggestions, and a new UI coming soon.